Chevrolet is taking to the Barrett-Jackson Scottsdale stage to auction off a special drop-top. 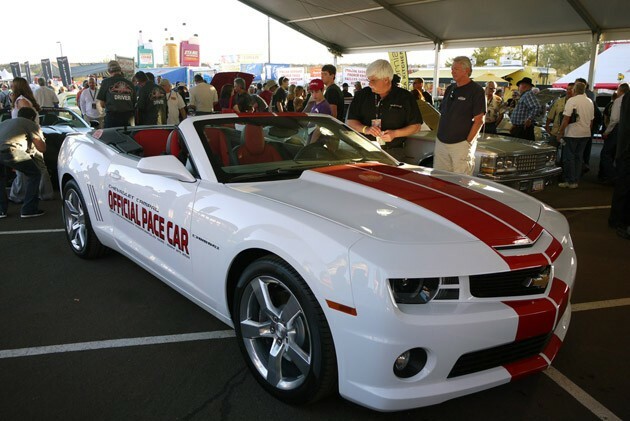 The first of 50 limited-edition cars, this 2011 Chevrolet Camaro Convertible Indy 500 Pace Car will cross the stage before heading to lead the field at the 100th running of the Indianapolis 500. The orange and white color combination matches that of the Indy-fied 1969 Chevrolet Camaro, which has since become a collectors item of its own. As far as we know, the Camaro 'Vert will be a 2012 model, but everything here at Barrett-Jackson is listing this as a 2011. Proceeds from the sale of this limited-edition Camaro will go the David Foster Foundation, which supports families with children in need of live-saving organ transplants. Charity cars have gone through the roof at the 2011 Barrett-Jackson auction and we would expect nothing different from this one. The Camaro Convertible doesn't have an official listing page, as it was something of a surprise for bidders, but you can watch Speed's live online coverage here. Are you playing Speed's Online Fantasy Bid Game? If not, test your auction pricing mettle by guessing what a series of featured vehicles will end up bringing at the auction block - you could end up winning a prize, like an Apple iPad. Enjoy! *Update: The final gavel price? $225,000. Click past the jump to watch this Camaro cross the auction block. Barrett-Jackson 2011: Chevrolet offers up a drop-top Camaro set to lead the Indy 500 field *Update: w/video originally appeared on Autoblog on Sat, 22 Jan 2011 20:50:00 EST. Please see our terms for use of feeds.